South Korea could send special envoys to Pyongyang ahead of the April 27 inter-Korean summit, presidential chief of staff Im Jong-seok said Tuesday. 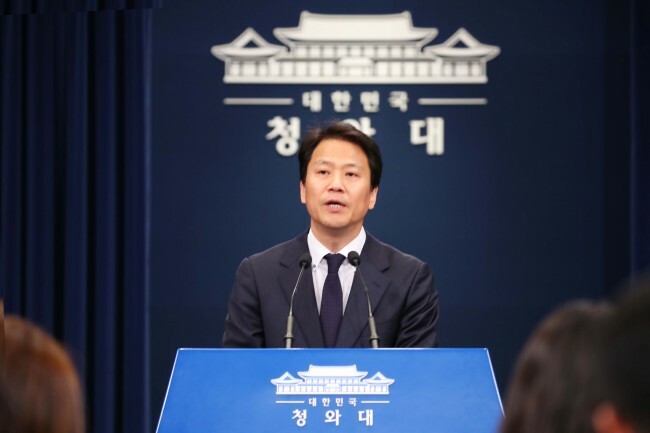 Im, who serves as the chief of the inter-Korean summit preparation committee, said that National Security Office chief Chung Eui-yong, or National Intelligence Service Director Suh Hoon, could be sent if necessary. “Communication (with North Korea) is always open on the level of the NIS. If necessary, it is possible that Chung or Suh could visit Pyongyang,” Im said. Chung and Suh were among five special envoys sent to North Korea by President Moon Jae-in early last month. Im also said that a hotline between Moon and North Korean leader Kim Jong-un is set to be established around April 20. During Chung’s visit last month, the two sides agreed to establish a channel of communication directly between the two leaders, and said that their first conversation over the channel would take place before the summit. Regarding the next high-level inter-Korean talks, Im said that the timing of the meeting depends on the working-level talks. The two sides are set to hold their second round of working-level talks at Panmunjeom on Wednesday and to discuss matters concerning media coverage and security for the two leaders at their summit. As for US-North Korea talks set to take place after the inter-Korean summit, a high-level Cheong Wa Dae official said that Panmunjeom could not be ruled out as a potential location. Washington and Pyongyang are reportedly engaged in back-channel dialogue to arrange the meeting between their two leaders. The time and date of the meeting have yet to be announced, but US President Donald Trump recently said that he would meet Kim in May or early June. “It is a matter for the US, and North Korea, but (the possibility) cannot be ruled out,” the official said.